One thing every website needs is a form builder. As a WordPress user, you have tons of options. Many are even free to use. However, if you are looking for a custom form builder, that is when you’ll probably need to fork out some money for a reliable one. The good news is, once you have chosen to buy a form builder plugin, then you will likely be using that plugin over and over on multiple sites – if you have one – or have multiple forms. It is definitely worth it if you are going to do any kind of serious business online. 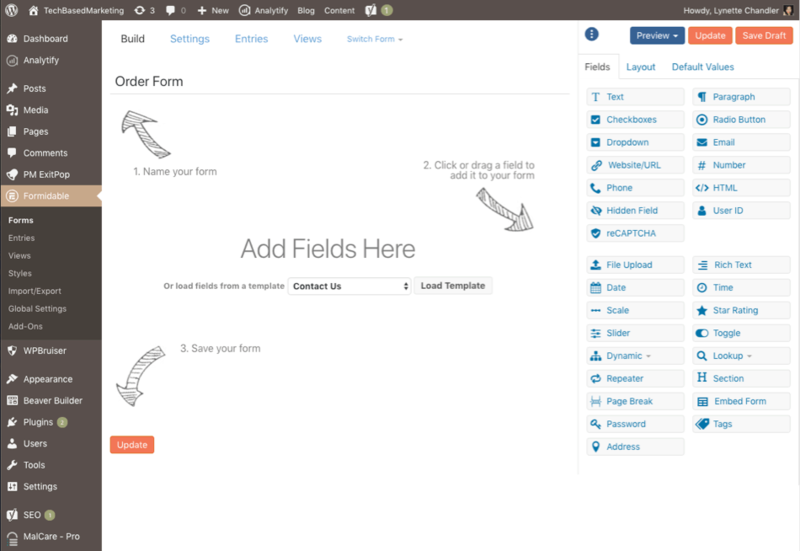 My favorite to build custom (or any) forms is Formidable Forms Pro. I have been using this plugin since its very early versions and it has never failed me. Here are some reasons why I like it. To add fields, you can simply drag them from the available fields panel into the form. Want to re-position the fields? Simply drag them up or down. Doesn’t get any simpler than that. You can of course edit the label of each field and give it a brief description. You can make the field required, read only or unique. You can also make each field visible to certain people only. For example, if you have a membership, you can set some fields for members only and some for everyone. This is more advanced, but if you want to make calculations with each field. You can also lookup a value. So let’s say you have two fields and you want pre-populate the 2nd field with the first. The lookup value will be useful here. This is also an advanced feature but one that gives the form a lot of power. An example when you’ll use this is if you want show field B if they entered Yes in A. Need someone to send you their logo or whatever file so you can proceed? Simply drag the file upload field into the form. You can also further customize this by restricting file types, allowing multiple file uploads and attaching it to the notification email. Reduce the overwhelm when you have an impossibly long form. Slice it up into multiple pages by adding page breaks where you want it. With Stripe and PayPal add-ons, you can take payments for just about anything. From events to delivering digital files. So yes, technically, you won’t need a shopping cart if you want to keep things light and simple although I would still advise a cart if you want an affiliate program and in general more flexibility. But this is a great way to start out by bootstrapping it. I love anything with Zapier integration because Zapier opens up your form to so many possibilities, not to mention the ability to automate your workflow. Nobody wants to re-build a form when you’ve created the ‘perfect’ one and it has too many settings for you to re-create properly. The solution is to save the form as a template you can re-use on the site and even export to other sites. Great for VA’s and web-designers. This is one area I feel many – even long time Formidable Forms users – have barely scratched the surface. Views basically allow you to take the information submitted and output it to a page and basically create listings. A common example how to use this is a business listing. You don’t have to spend hours copying and pasting the information people have already submitting into your page. With views, the listing can be pulled into your page automatically saving you loads of time. I’ve barely scratched the surface of what you can do with the form. In a nutshell. A lot. Almost the majority of forms that you need, you can create with Formidable Forms. They do have a free version in the WordPress plugin library, but if you want the advanced features mentioned here, you will need the Pro version. Formidable Forms has saved me countless hours of work. It has also allowed me to make money with it when I was still working with clients. An excellent investment. You won’t be disappointed.